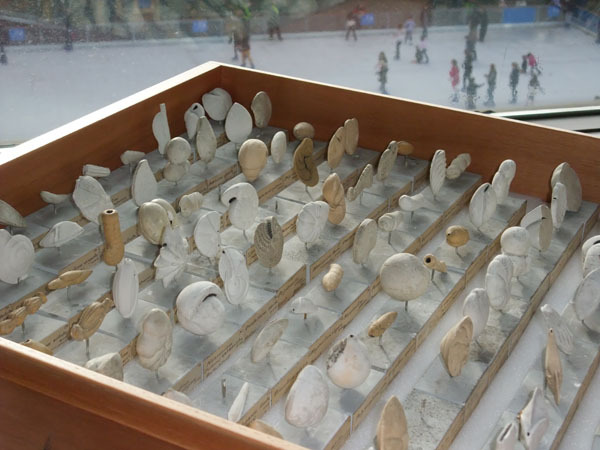 This week a surplus set of plaster microfossil models were transferred to the Department of Geology, University Leicester UK to help with teaching micropalaeontology to undergraduate students. 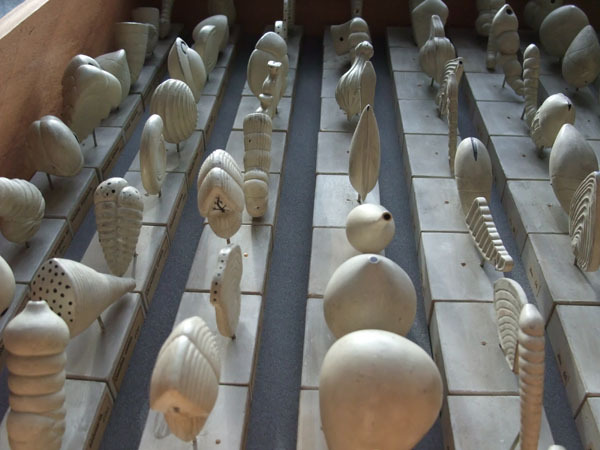 The two sets of models were made by 19th Century scientists d'Orbigny (1802-1857) and Reuss (1811-1873), who were some of the very earliest micropalaeontologists. A set of d'Orbigny models from the Museum collections. Some look a dirty brown colour but in fact this is an original feature to show the difference between models based on modern species (white) and fossil ones (brown). This set was previously mounted for display in the Museum galleries. The famous French scientist Alcide d'Orbigny quickly recognised the difficulty in portraying his work on microfossils to a wider audience because of the small size of the specimens. 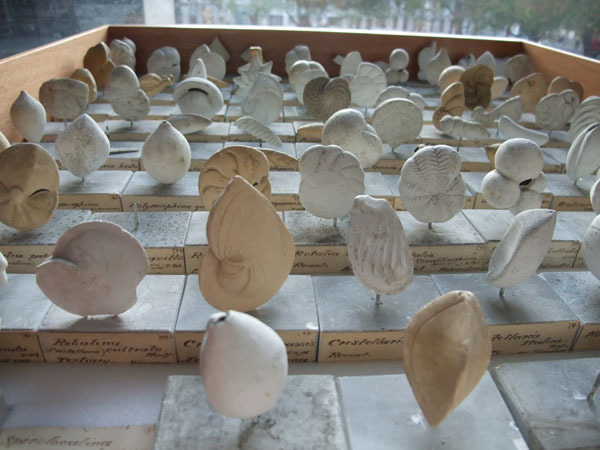 He carved scale models of foraminferal microfossils from limestone and these originals are in the Museum national d'Histoire naturelle in Paris. He used these to create plaster replicas that he sold in sets to accompany his publication of the first classification of the Foraminifera which was first published back in 1821. A 'Plaster Army' of Reuss & Fric models arranged in rows reminiscent of the 'Terracotta Army'. The second set was made by Vaclav Fric (1839-1916) under the supervision of Anton Reuss who was similarly looking to illustrate his classification of the Foraminifera. For more information about these models and other microfossil models at the Museum there is a publication in the Geological Curator. A paper was recently submitted for publication in a Special Publication of the Geological Society as a contribution to a set of papers on the history of study of the Foraminifera. Some more Reuss & Fric models. The black spots show the openings or 'foramen' common to and therefore giving rise to the name 'Foraminifera'. If these models are so important, why are we letting them go from the Museum? Firstly we already have three registered sets of these models in our collections (some are illustrated above). One of these three sets is is on the salvage list for the Palaeontology Department. This means that these will be some of the first items to be saved from the building should there be some sort of disaster and it is deemed safe to do so. Secondly, the model sets on their way to the University of Leicester were never formally accessioned into the Museum collections so we are able to send them on without having to deaccession them. They are slightly worn as they have previously been used for teaching micropalaeontology to postgraduate students. Currently there are limited opportunities for postgraduate study of micropalaeontology so it is very good to know that a new course is starting at the University of Birmingham in September 2012. This is Giles Miller's Curator of Micropalaeontology blog. 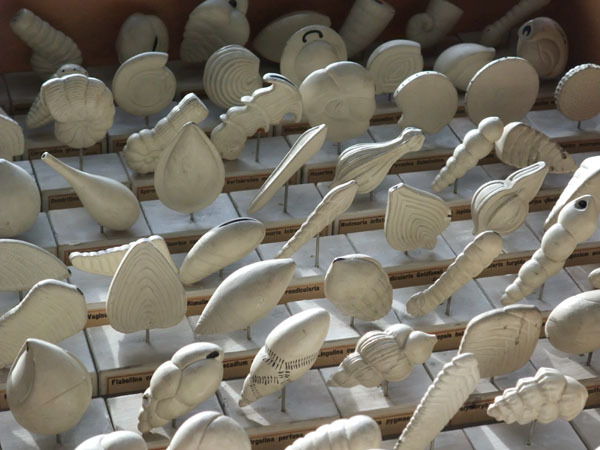 I make the Museum micropalaeontology collections available to visitors from all over the world, publish articles on the collections, give public talks and occasionally make collections myself. Giles Miller on Conodonts - the most controversial microfossils? Chris W on Conodonts - the most controversial microfossils? Valeria Luciani Ferrara Univ.Italy on Where can you find a giant sculpture of one of our type species? Are behind-the-scenes collections for scientists only?